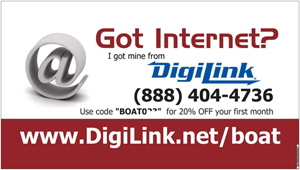 Internet for your Boat - Customer Referral Program. Refer a friend, neighbor or complete stranger and receive 50% OFF your next month bill. We will credit you 50% off your next month bill for every new customer you send our way. Refer two and your next month is absolutely FREE. There is no limit on how many customers you can refer in any given month and we will prorate the benefits to upcoming months if more than 2 sign up. New customers will benefit too. Each will receive 20% off their first month for mentioning your name or using your unique coupon code. To help with referrals we can also provide an easy to post banner with your personal code. Hang it on your boat and let it work for you when you're not around. Advertise your code on Twitter, Facebook, personal blog or other social medium to make your internet connection pay for itself. We will email you your personal referral code. Send people to http://www.DigiLink.net/boat. Tell them to use your code or name in the Referral box on the order form. Each time a new customer signs up, you will receive a discount and they will get 20% off as well. It's a win-win situation! That's it! Enjoy your rewards! Fill out the form on the right and checkmark "Send me a banner". We will print a banner like this with your referral code embeded. Hang it on your boat so it's easily visible to your neighbors or boats passing by.